Sir William Hastings, Chairman of Hastings Hotels is pictured at the Everglades Hotel, with general manager Neil Devlin, keeping an eye on the progress of the �1.5 million refurbishment of the Grand Ballroom. The Everglades Hotel in Londonderry is set to unveil its impressive £1.5m grand ballroom in just 10 weeks. Sir William Hastings, Chairman of Hastings Hotels has announced it is on track to reopen at the beginning of April. He said: “We have a team of 25 builders working hard to get the project completed and I am pleased to report that we are on schedule for the new event space to open in April. 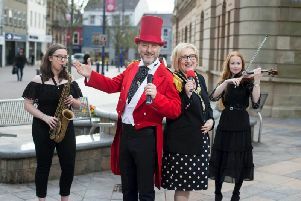 “Upon completion, it will be able to seat 650 people theatre style and over 400 when set up for round table events making it the largest facility of its kind in the North West and I am confident that it will enable the city to attract events that it was unable to accommodate previously including larger conferences and business events,” Sir William added. For further information on holding an event in the new Grand Ballroom at the Everglades Hotel contact 028 7134 9200.